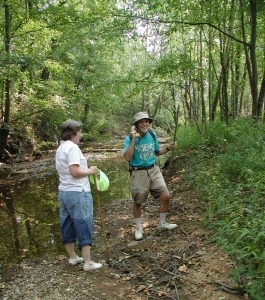 Since Summer 2005 during periods of low water, James Lowery has been walking in sections of Shades Creek and its 3 major urban tributaries in the Birmingham area. By walking in the creeks, he has been able to find the sources of the creeks (some of which start underneath buildings or city streets) and has been able to observe first hand the dynamics of the creeks, what has been done to them in the urban environment, the wildlife of the creeks, and the things that people have thrown into the creeks or that have washed in through storm drains. Why did Mr. Shadey and a turtle drink a Pepsi in a ditch? Read about their adventure in Scott's Branch! Watkins Brook is one of Mr. Shadey's favorite places to play sports, read books, and bring his kids. See why here. Read about the time that Mr. Shadey found everything plus the kitchen sink in Griffin Brook.